BAM! And just like that, I’m back for the second day in a row. Was actually really shocked that I have not yet written a post for you about this salmon. It’s like… my new favorite recipe. I think I’ve made this three or four times so far- which is a lot for someone who rarely repeats one recipe twice. This salmon recipe obviously uses Miso- which sounded a little intense for me at first… until I went to Whole Foods and bought a container of it and realized how silly it was for me to think that. It’s kept in the refrigerated section and lasts forever. Just go buy a container and leave it in your fridge for a great dressing recipe (such as this one… ) or to make the salmon again like I did. Combine first 4 ingredients, stirring with a whisk. Arrange fish in a shallow baking dish coated with foil & cooking spray. Spoon miso mixture evenly over fish. Broil 8-10 minutes or until fish flakes easily when tested with a fork, basting twice with miso mixture. Sprinkle with chives. So so so so good. For some reason, every single time I’ve baked salmon this way, it has been SUPER moist and so delicious. Keep your eye on the salmon in the oven because you don’t want to dry it out. It does not need that much time so don’t forget about it! I like to make 4 fillets so Dave and I can each eat one for dinner and eat one for lunch the following day over a salad. YUM. 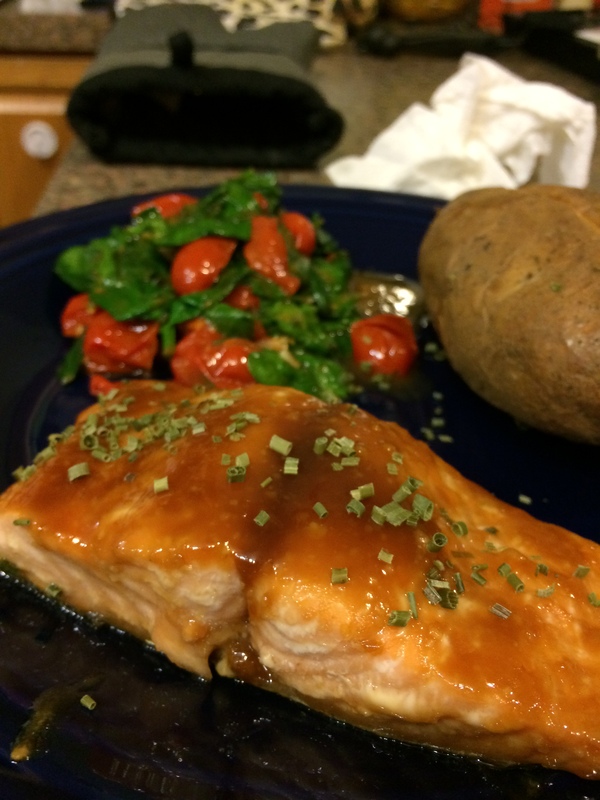 This time, I served the salmon with a small Baked Potato & Sauteed Spinach w/ Garlic & Grape Tomatoes. 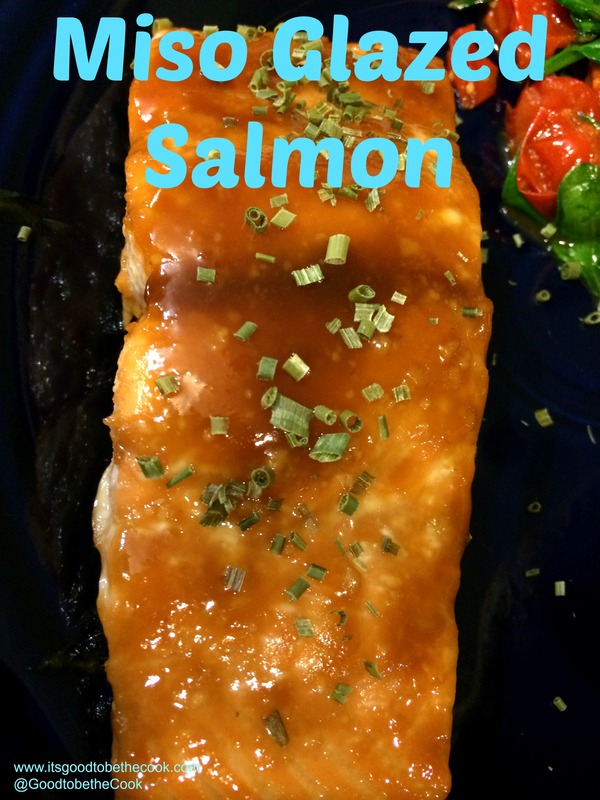 You could serve this salmon with any green and it would be great with rice too!